As some of you may recall, I spent a week last fall on MacMania V, a Geek Cruise through the western Caribbean. This time, I’m writing to you from MacMania VI, headed north to Alaska from Seattle. Joining me this time, as before, is my wife Marian. But this time, we also chose to bring our eldest child, Kylie (who turns four in a month). I also managed to talk my mother and her husband into joining us, so that we’d have plenty of help watching Kylie—and so that they might get a bit of Mac education out of it as well! As we live but a few hours south in Portland, getting to the cruise was much simpler than flying across the country to Florida—we just piled everyone (and a large collection of luggage) into the family hauler around 9:30 a.m. Saturday, and headed north on I-5 to Seattle. Arrival and boarding were very smooth. We were able to park directly next to the terminal, and from there, it only took about 20 minutes to get the necessary paperwork out of the way and board the ship. We spent the next few hours exploring our home for the week, the MS Oosterdam . This is a large vessel; bigger than the Veendham that we used for the western Caribbean cruise. Thankfully, our stateroom is located almost directly in the middle of the ship—though that just means that everything is equally far away, and pretty much nothing is close. In the video player on the right is a brief movie I shot of the view as you ride up—sorry for the small size, but “fast upload speed” apparently isn’t something that’s been requested by all that many cruise participants! The Seattle port area is quite busy, consisting of a diverse mix of traditional dock activities, modern luxury cruise ships, smaller pleasure craft, and numerous ferries. The scale of some of the dock equipment, such as these cranes used to unload container ships is staggering. The photo in today’s album doesn’t really convey the sheer enormity of these cranes, though the sailboat in the foreground helps (look at the size of the people on deck). After taking care of the emergency drill, it was time to start our journey north. For the second time in as many cruises, I was amazed at how silently such a large vessel can get under way—I looked out our window at one point, and was surprised to see that the dock was now 100 yards away. There had been no perceptible motion, and in our cabin at least, we hadn’t heard any engine noise. It was as if this immense ship had just teleported itself away from the dock. As we moved towards open water, we slid past another cruise ship, the Golden Princess , as seen below. 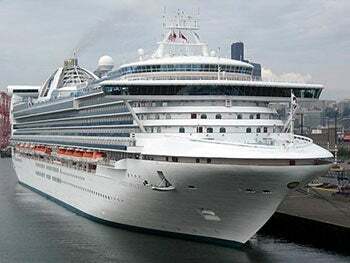 Google tells me that the Golden Princess is a bit larger than the Oosterdam —15 feet longer and 12 feet wider—but carries 800 more passengers! By comparison, the Oosterdam is definitely a low-density ship, which is fine by me. We stood outside for a while and watched the city of Seattle slip behind us, offering some nice views of its skyline as it did so. Between departure and 7 p.m., we explored the far reaches of the ship, marveling at some of the sights. The Oosterdam features four external glass elevators midships—they zip you from deck two up to deck nine in seconds, offering some amazing views as you go. There are also four swimming pools, though the one out on the back deck probably won’t get a lot of use, given the strong winds and not-exactly-warm air temperatures expected for much of the cruise. Beyond the pools and elevators, you can find everything from a casino to a Hold’em poker room (which I definitely hope to test some evening), lots of places to shop, a nightclub, a kid’s zone, outdoor basketball and volleyball courts (surrounded by netting, of course, as 30 knots of wind can send volleyballs flying a looooooong way), a culinary demonstration room, a large theater, and probably a half-dozen more places to spend some money, interact with others, or just kick back and relax. At 7 p.m., we had the Geek Cruises kick-off meet-and-greet in the Crow’s Nest, a great room that sits up high near the bow (front) of the ship. Neil Bauman, Insight Cruises’ president, noted that this is the 37th Geek Cruise, and pointed out that Randall Schwartz has been on all 37 of them. (Randall is a fellow Portland resident and Unix wizard extraordinaire. He helps Neil with the technical end of the conference.) Neil also introduced a number of other multi-cruise attendees, many of whom were on at least their fifth cruise. 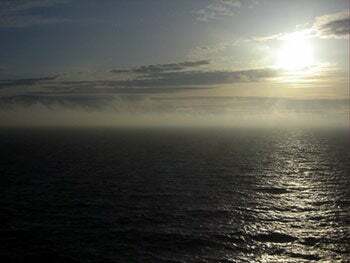 The view from the Crow’s Nest was quite nice, as the sun was setting in front of us through some scattered clouds hanging low to the water. Though only my second such meeting, I’ve found both functions useful as a way to get to know the attendees prior to the start of sessions, which helps make the sessions feel more personal and less formal. My first session is coming up soon, so I spent the remainder of the evening going over my slides and playing with my daughter (who seems to be having a blast so far).